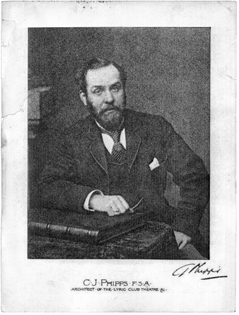 Charles J Phipps was an established theatre architect, who designed and remodelled over 70 theatres in his career, including London’s famous Savoy Theatre. Phipps was brought in to rebuild the Theatre Royal in 1879 after it was destroyed by fire. Phipps made some major changes to George Bell’s original design. He moved the main entrance from Cowcaddens onto Hope Street, introduced its horseshoe curve and a fourth seating level within the auditorium. When a second fire destroyed the auditorium in 1894, Phipps returned again to help rebuild it. Today, the Theatre Royal remains the largest surviving example of Phipps’ work.